Summary: Its this reminder of, still, the inequality of white and black characters in film that undermines the whole premise of The Secret Life of Bees. The Secret Life of Bees, based on the novel by Sue Monk Kidd, is simultaneously a source of hope and a massive disappointment. Hope, because this is what would have been called a women’s picture – other than Paul Bettany, the cast is almost entirely female and female centred – and even more pleasingly most of those women are black; it is directed by a black woman, and Will and Jada Pinkett Smith are among the list of producers. Of the disappointment, more later. Lily (Fanning) is a lonely little moppet. Teetering on the edge of puberty, she has been dragged up by her neglectful, bitter father T-Ray (Bettany), and carries a burden that no child should bear – her father reminds her regularly that she killed her mother when she was four years old. And not only that, but her mother had left her, and wasn’t coming back. Lily’s only source of affection is Rosaleen (Hudson), her nanny, but this is the Civil Rights era and even the feisty Rosaleen cannot fight against T-Ray’s daily petty cruelties. 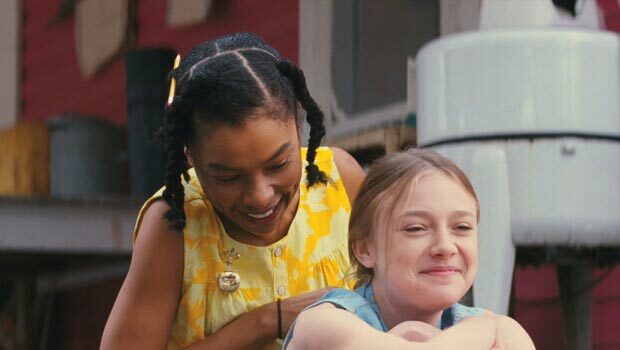 When Rosaleen is beaten for attempting to vote, she and Lily flee to Tiburon, South Carolina, a place with some mysterious connection to Lily’s mother, and there they meet the Boatwright sisters: August (Latifah), the matriarch and owner of their honey business, June (Keys), a fiercely independent music teacher, and May (Okenedo), who is one sandwich short of a picnic. August immediately and without question takes them in, offering Lily a role as apprentice beekeeper, while Rosaleen helps May around the house. And for the first time in her life Lily has space to just live and be; surrounded by these calm, strong women, she blossoms. As discussed, there are some good things about The Secret Life of Bees. Simply seeing an ensemble cast of black women in a mainstream Hollywood release is exciting and their performances are all pitch perfect (apart from Okenedo’s May who is, frankly, annoying. But this is not the actor’s fault, the character is meant to be lachrymose and unbalanced); the film is competently made and reasonably entertaining, so why didn’t I like it? The film’s fatal flaw is in the source material and is my grip with many other films supposedly starring black actors (The Legend of Bagger Vance, The Bucket List etc): the black people are colourfully exotic, wise and in someway spiritual and, always, exist to solve the problems of the messed up white folk who just need to eat some berry cobbler and learn to stop worrying. Lily is nothing but trouble to the Boatwrights, she’s a freeloader and a liar; the story takes place just as Martin Luther King is assassinated, a time of heightened tension between blacks and whites, yet August does not hesitate to bring Lily into their home. A home that is, incidentally, painted bright pink and hosts a bizarre church based around the worship of a black madonna (it seems extremely unlikely that this would have been tolerated, let alone accepted in the pre-Civil Rights era south). Bees and honey are a constant metaphor in the film, which ultimately drowns in a sea of sweetness, overwhelmed by its own desire for closure and a happy ending for Lily, never mind the cost to others. Its this reminder of, still, the inequality of white and black characters in film that undermines the whole premise of The Secret Life of Bees.